A&A Coatings has many years of hands-on experience in improving vehicle performance and increasing the service lifespan of automotive components through a set of processes collectively referred as thermal spraying. 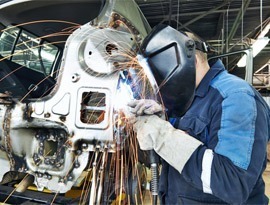 We provide specialized coatings for a wide range of engine transmission, steering and suspension components and many other automobile parts that are susceptible to wear and corrosion. With over 7 decades of combined cross-industry experience, we are confident to harness our technical knowledge and unparallel expertise for enhancing automobile performance. Our primary aim is to eliminate the need for cast-iron liners that are extremely heavy. We also aim to reduce fuel consumption significantly, reduce weight and carbon-monoxide emission as well as prevent corrosion in engine parts. Plasma spraying is very effective in protecting primary engine components such as piston rings, turbochargers and etc. A&A Coatings uses only the best-grade materials to ensure that automotive parts last longer and function seamlessly through their service life spans. Having a strategic tie-up with OEMs, we enjoy the competitive edge in the current automotive thermal spraying market. Plasma heat treatments, diamond-like coatings and physical vapor deposition are just some of the techniques that we use for increasing wear and corrosion resistance in transmission parts. A&A Coatings’ surface treatment services are arguably the most economical set of solutions for increasing the service lifespan of suspension parts and for developing wear and corrosion resistance in ball joints. Our services are proven to be instrumental in improving fatigue strength in these components, increasing surface protection and enhancing friction properties. We don’t use volatile organic compounds and the coating process can be seamlessly integrated into the production line of your automobile manufacturing facility. Our materials engineers and spray technicians at A&A Coatings have decades of experience in thermal spraying for manufacturing businesses in the automotive industry. Because we know that the quality of your automotive parts and machineries play a big role in your final products, our coatings are designed to help you protect those components at the highest level. Do send us an enquiry today to know more about our specialized services for the automotive industry.